Mark Elliot Zuckerberg (/ˈzʌkərbɜːrɡ/; born May 14, 1984) is an American technology entrepreneur and philanthropist. He is known for co-founding and leading Facebook as its chairman and chief executive officer. Born in White Plains, New York, Zuckerberg attended Harvard University, where he launched Facebook from his dormitory room on February 4, 2004, with college roommates Eduardo Saverin, Andrew McCollum, Dustin Moskovitz, and Chris Hughes. Originally launched to select college campuses, the site expanded rapidly and eventually beyond colleges, reaching one billion users by 2012. Zuckerberg took the company public in May 2012 with majority shares. His net worth is estimated to be $55.0 billion as of November 30, 2018, declining over the last year with Facebook stock as a whole. In 2007 at age 23 he became the world's youngest self-made billionaire. As of 2018, he is the only person under 50 in the Forbes ten richest people list, and the only one under 40 in the Top 20 Billionaires list. "Zuckerberg" redirects here. For other people with the surname, see Zuckerberg (surname). At Ardsley High School, Zuckerberg excelled in classes. He transferred to the private school Phillips Exeter Academy, in New Hampshire, in his junior year, where he won prizes in science (mathematics, astronomy, and physics) and classical studies. In his youth, he also attended the Johns Hopkins Center for Talented Youth summer camp. On his college application, Zuckerberg stated that he could read and write French, Hebrew, Latin, and ancient Greek. He was captain of the fencing team. 1 2 "Facebook, Inc. Proxy Statement". United States Security and Exchange Commission. April 26, 2013. p. 31. Retrieved March 30, 2014. On January 1, 2013, Mr. Zuckerberg's annual base salary was reduced to $1 and he will no longer receive annual bonus compensation under our Bonus Plan. 1 2 "Mark Zuckerberg". Forbes. ↑ Hiltzik, Michael (May 20, 2012). "Facebook shareholders are wedded to the whims of Mark Zuckerberg". Los Angeles Times. Archived from the original on December 2, 2017. ↑ Carlson, Nicholas (March 5, 2010). "At Last – The Full Story Of How Facebook Was Founded". Business Insider. ↑ "Mark Zuckerberg, Bloomberg Billionaires Index". Bloomberg. ↑ Shinal, John (2017-08-01). "Mark Zuckerberg is less than half the age of his super-wealthy peers". www.cnbc.com. Retrieved 2019-01-15. 1 2 Grossman, Lev (December 15, 2010). "Person of the Year 2010: Mark Zuckerberg". Time. Archived from the original on August 17, 2013. ↑ "The All-Time TIME 100 of All Time". Time. April 18, 2012. Archived from the original on April 19, 2012. Retrieved April 20, 2012. ↑ "The World's Most Powerful People". Forbes. December 2016. Retrieved December 14, 2016. ↑ Malone, Jasmine (December 15, 2010). "Mark Zuckerberg wins Time person of the year: profile". The Daily Telegraph. London, UK. 1 2 3 4 Vargas, Jose Antonio (September 20, 2010). "The Face of Facebook". The New Yorker. Retrieved September 22, 2010. 1 2 Pfeffer, Anshel (October 4, 2017). "Mark Zuckerberg's Carefully Curated Jewish Conscience Is Both Shallow and Evasive". Haartez. Retrieved May 12, 2018. ↑ Zuckerberg, Mark (January 27, 2017). "My great grandparents came from Germany, Austria, and Poland". Facebook. PaloAlto. ↑ Burrell, Ian (July 24, 2010). "Mark Zuckerberg: He's got the whole world on his site". The Independent. UK. Retrieved November 6, 2010. 1 2 3 Julie Zauzmer (December 30, 2016). "Mark Zuckerberg says he's no longer an atheist, believes 'religion is very important'". The Washington Post. Retrieved December 30, 2016. 1 2 Kirkpatrick, David (2010). The Facebook Effect: The Inside Story of the Company That Is Connecting the World. New York: Simon & Schuster. pp. 20–21. ISBN 978-1-4391-0211-4. Retrieved November 9, 2010. ↑ McDevitt, Caitlin (March 5, 2010). "What We Learned About Mark Zuckerberg This Week". The Big Money. Retrieved March 5, 2010. ↑ Grynbaum, Michael M. (June 10, 2004). 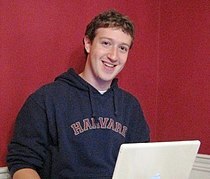 "Mark E. Zuckerberg '06: The whiz behind thefacebook.com". The Harvard Crimson. ↑ "4-thing-mark-zuckerberg". Retrieved April 21, 2016. ↑ "facebook-founder-mark-zuckerberg-child-prodigy". Retrieved April 21, 2016. ↑ Hemos/Dan Moore (April 21, 2003). "Machine Learning and MP3s". Slashdot. Retrieved September 3, 2010. ↑ Dreier, Troy (February 8, 2005). "Synapse Media Player Review". PC Magazine. Retrieved September 3, 2010. 1 2 Grimland, Guy (October 5, 2009). "Facebook founder's roommate recounts creation of Internet giant". Haaretz. ↑ Hoffman, Claire (June 28, 2008). "The Battle for Facebook". Rolling Stone. New York City: Wenner Media LLC. Archived from the original on July 3, 2008. Retrieved February 5, 2009. ↑ Seward, Zachary M. (July 25, 2007). "Judge Expresses Skepticism About Facebook Lawsuit". The Wall Street Journal. New York City: Dow Jones & Company. Retrieved April 30, 2008. ↑ Carlson, Nicolas (March 5, 2010). "In 2004, Mark Zuckerberg Broke Into A Facebook User's Private Email Account". Business Insider. New York City: Axel Springer SE. Retrieved March 5, 2010. ↑ Stone, Brad (June 28, 2008). "Judge Ends Facebook's Feud With ConnectU". New York Times blog. ↑ Rushe, Dominic (February 2, 2012). "Facebook IPO sees Winklevoss twins heading for $300m fortune". The Guardian. London, England. ↑ Klepper, David (November 9, 2011). "Mark Zuckerberg, Harvard dropout, returns to open arms". Christian Science Monitor. Boston, Massachusetts: Christian Science Publishing Society. Retrieved January 27, 2019. ↑ Fell, Jason (14 May 2014). "As Mark Zuckerberg Turns 30, His 10 Best Quotes as CEO". Entrepreneur. Irvine, California: Entrepreneur Media, Inc. Retrieved May 16, 2014. ↑ Steinbock, Anna (May 25, 2017). "Harvard awards 10 honorary degrees". Harvard Gazette. Retrieved May 25, 2017. ↑ "13 YEARS AFTER QUITTING, FACEBOOK CEO MARK ZUCKERBERG GETS HONORARY HARVARD DEGREE". PPP Focus. May 28, 2017. ↑ "Mark Zuckerberg's career in 90 seconds". The Daily Telegraph. Retrieved March 3, 2017. 1 2 Antonas, Steffan (May 10, 2009). "Did Mark Zuckerberg's Inspiration for Facebook Come Before Harvard?". ReadWrite Social. SAY Media, Inc. Archived from the original on February 1, 2012. Retrieved March 26, 2013. 1 2 "Face-to-Face with Mark Zuckerberg '02". Phillips Exeter Academy. Phillips Exeter Academy. January 24, 2007. Retrieved March 26, 2013. ↑ Alice Speri (August 7, 2012). "Zuckerberg's Roomie Aims to Win for Haiti". The Wall Street Journal. Retrieved March 26, 2013. ↑ Teller, Sam (November 1, 2005). "Zuckerberg To Leave Harvard Indefinitely". The Harvard Crimson. The Harvard Crimson, Inc. Retrieved March 26, 2013. ↑ Kevin J. Feeney (February 24, 2005). "Business, Casual". The Harvard Crimson. The Harvard Crimson, Inc. Retrieved March 26, 2013. 1 2 3 Singel, Ryan (May 28, 2010). "Epicenter: Mark Zuckerberg: I Donated to Open Source, Facebook Competitor". Wired News. Condé Nast Publishing. Retrieved May 29, 2010. ↑ MacMillan, Robert (April 1, 2009). "Yu, Zuckerberg and the Facebook fallout". Reuters. Retrieved March 26, 2013. In a back-to-the-future move, former Netscape CFO Peter Currie will be the key adviser to Facebook about financial matters, until a new search for a CFO is found, sources said. 1 2 3 Levy, Steven (April 19, 2010). "Geek Power: Steven Levy Revisits Tech Titans, Hackers, Idealists". Wired. Retrieved September 23, 2010. 1 2 McGirt, Ellen (February 17, 2010). "The World's Most Innovative Companies 2010". Fast Company. Retrieved September 24, 2010. ↑ "The Vanity Fair 100". Vanity Fair. October 2010. Retrieved September 23, 2010. ↑ "The Vanity Fair 100". Vanity Fair. September 1, 2010. Retrieved September 23, 2010. ↑ "Mark Zuckerberg – 50 People who matter 2010". New Statesman. UK. Retrieved September 27, 2010. ↑ "Facebook's Zuckerberg says Steve Jobs advised on company focus, management". Bloomberg. November 7, 2011. Retrieved November 12, 2011. ↑ "Zuckerberg in Moscow to boost Facebook's presence". France 24. October 1, 2012. Archived from the original on October 3, 2012. 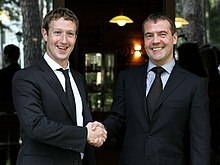 ↑ "Russia pushes Facebook to open research center". Fox News. October 1, 2012. ↑ Delo, Cotton (April 16, 2013). "Facebook Practices What It Preaches for 'Home' Ad Blitz". Ad Age digital. Crain Communications. Retrieved April 18, 2013. ↑ Caitlin Dewey (August 19, 2013). "Mark Zuckerberg's Facebook page was hacked by an unemployed web developer". The Washington Post. Retrieved August 19, 2013. 1 2 Edwards, Victoria (September 21, 2013). "6 Things We Learned From Marissa Mayer and Mark Zuckerberg at TechCrunch Disrupt 2013". TechCrunch. AOL Inc. Retrieved September 23, 2013. 1 2 Stevenson, Alastair (August 22, 2013). "Mark Zuckerberg Creates Tech Justice League to Bring Internet to the Masses". Search Engine Watch. Incisive Media Incisive Interactive Marketing LLC. Retrieved September 23, 2013. ↑ Mark Gregory (February 22, 2014). "Mobile World Congress: What to expect from Barcelona". BBC News. Retrieved February 24, 2014. ↑ Alex Hern, Jonathan Kaiman (October 23, 2014). "Mark Zuckerberg addresses Chinese university in Mandarin". The Guardian. Retrieved December 14, 2014. ↑ Maria Tadeo (December 12, 2014). "Mark Zuckerberg Q&A: What we learnt about the Facebook founder". The Independent. Retrieved December 14, 2014. ↑ Sam Colt (December 12, 2014). "Facebook May Be Adding a 'Dislike' Button". Inc.. Monsueto Ventures. Retrieved December 14, 2014. ↑ "The top 10 business visionaries creating value for the world". Business Insider. Business Insider Inc.
↑ Martey Dodoo (August 16, 2004). "Wirehog?". Martey Dodoo. ↑ Alan J. Tabak (August 13, 2004). "Zuckerberg Programs New Website". Harvard Crimson. ↑ "80000 developers". Archived from the original on March 24, 2017. Retrieved April 21, 2016. ↑ "The Facebook Blog | Facebook". Blog.facebook.com. Retrieved June 26, 2010. ↑ "2007 Young Innovators Under 35: Mark Zuckerberg, 23". MIT Technology Review. 2007. Retrieved August 14, 2011. ↑ "Meet at the Silicon Valley among the tech leaders and Indian Prime Minister-Narendra Modi". Retrieved October 9, 2015. ↑ "Mark Zuckerberg supports Digital India". Retrieved October 9, 2015. ↑ Carlson, Nicholas. "In 2004, Mark Zuckerberg Broke Into A Facebook User's Private Email Account". Silicon Alley Insider. Retrieved March 5, 2010. ↑ Logged in as click here to log out (February 12, 2009). "Facebook paid up to $65m to founder Mark Zuckerberg's ex-classmates". The Guardian. UK. Retrieved August 21, 2009. ↑ McCarthy, Caroline (November 30, 2007). "article about 02138". News.com. Retrieved June 26, 2010. ↑ Hempel, Jessi (July 25, 2009). "The book that Facebook doesn't want you to read". CNN. Archived from the original on September 14, 2010. Retrieved May 21, 2011. ↑ West, Jackson. "Facebook CEO Named in Pakistan Criminal Investigation". NBC Bay Area. Retrieved June 26, 2010. ↑ "Zuckerberg faces criminal investigation in Pakistan". ↑ Anderson, John (July 29, 2010). "Facebook does not have a like button for Ceglia". WellsvilleDaily.com. Retrieved August 29, 2010. ↑ "Venture beat coverage of Ceglia lawsuit". ↑ "Feds Collar Would-Be Facebook Fraudster". E-Commerce News. October 29, 2012. ↑ "A Dubious Case Found Lawyers Eager to Make Some Money". The New York Times. October 29, 2012. ↑ "Paul Ceglia's lawyer drops out of Facebook suit after arrest". San Jose Mercury News. October 30, 2012. ↑ "Israeli minister accused facebook and its founder". Newsweek. Retrieved July 4, 2016. ↑ "Mark Zuckerberg is facing claims that Facebook is not helping Israel crack down on terror". Express. Retrieved July 3, 2016. ↑ "Mark Zuckerberg has terror victim's 'blood on his hands', Israeli minister says". International Business Times. Retrieved July 4, 2016. ↑ "Facebook, Social Media Privacy, and the Use and Abuse of Data | United States Senate Committee on the Judiciary". www.judiciary.senate.gov. Retrieved 2018-04-10. ↑ "MArk Zuckerberg Facebook Post". Facebook. 28 April 2018. ↑ Fried, Ina (June 2, 2010). "Zuckerberg in the hot seat at D8". CNET. Retrieved June 26, 2010. ↑ Harlow, John (May 16, 2010). "Movie depicts seamy life of Facebook boss". The Times. London. Retrieved July 18, 2010. ↑ Cieply, Michael & Helft, Miguel (August 20, 2010). "Facebook Feels Unfriendly Toward Film It Inspired". The New York Times. Retrieved September 22, 2010. ↑ Harris, Mark (September 17, 2010). "Inventing Facebook". New York. Retrieved September 22, 2010. ↑ "The Social Network Filmmakers Thank Zuckerberg During Golden Globes". Techland. January 17, 2011. ↑ "Last Night, Aaron Sorkin Demonstrated How to Apologize Without Accepting Responsibility". New York. January 17, 2011. ↑ "Mark Zuckerberg Meets Jesse Eisenberg on Saturday Night Live". People. January 30, 2011. Archived from the original on January 31, 2011. Retrieved January 30, 2011. ↑ "Jesse Eisenberg meets the real Mark Zuckerberg on SNL". Digital Trends. January 31, 2011. ↑ "Facebook Creator Mark Zuckerberg to Get Yellow on The Simpsons". New York. July 21, 2010. Retrieved September 22, 2010. ↑ Griggs, Brandon (October 11, 2010). "Facebook, Zuckerberg spoofed on 'SNL'". CNN. Retrieved October 11, 2010. ↑ "Mark Zuckerberg 'Liked' SNL's Facebook Skit". New York. October 12, 2010. Retrieved January 28, 2011. ↑ Lerer, Lisa & McMillan, Traci (October 30, 2010). "Comedy Central's Stewart Says Press, Politicians Are Creating Extremism". Bloomberg. Retrieved November 4, 2010. ↑ Hoback, Cullen. "Our data is our digital identity - and we need to reclaim control | Technology". The Guardian. Retrieved May 25, 2014. ↑ "Mark Zuckerberg savaged by 'South Park". CNET. October 12, 2017. Retrieved April 2, 2018. ↑ "Mayor Says Newark Is 40% There in Matching Facebook Founder's Grant". The Chronicle of Philanthropy. September 27, 2010. ↑ Ng, Philiana (September 24, 2010). "Mark Zuckerberg: 'The Social Network' is 'fun'". The Hollywood Reporter. Archived from the original on September 15, 2012. ↑ Tracy, Ryan (November 23, 2010). "Can Mark Zuckerberg's Money Save Newark's Schools?". Newsweek. Archived from the original on November 30, 2010. ↑ Reidel, David (September 22, 2010). "Facebook CEO to Gift $100M to Newark Schools". CBS News.com. Retrieved September 23, 2010. ↑ "Mark Zuckerberg's Well-Timed $100 million Donation to Newark Public Schools". New York. September 22, 2010. Retrieved September 28, 2010. 1 2 Isaac, Mike (September 24, 2010). "Zuckerberg Pressured To Announce $100 million Donation To Newark". Forbes. Retrieved September 28, 2010. ↑ "Mark Zuckerberg's $100 million donation to Newark public schools failed miserably — here's where it went wrong". ↑ Kotlowitz, Alex (August 19, 2015). "'The Prize,' by Dale Russakoff". The New York Times. 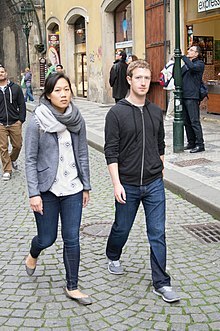 ↑ "Mark Zuckerberg and Priscilla Chan". Giving Pledge. ↑ "Zuckerberg to give away 99% of shares". BBC. December 2, 2015. ↑ "Facebook's Mark Zuckerberg biggest giver in 2013". USA Today. February 10, 2014. ↑ Phillip, Abby (October 14, 2014). "Facebook's Mark Zuckerberg and wife Priscilla Chan donate $25 million to Ebola fight". The Washington Post. Retrieved October 25, 2014. ↑ Kroll, Luisa (October 14, 2014). "Mark Zuckerberg Is Giving $25 Million To Fight Ebola". Forbes. Retrieved October 25, 2014. ↑ "Mark Zuckerberg Vows to Donate 99% of His Facebook Shares for Charity". The New York Times. December 1, 2015. ↑ "Facebook's Mark Zuckerberg to give away 99% of shares". BBC News. December 1, 2015. Retrieved December 1, 2015. ↑ "How Mark Zuckerberg's Altruism Helps Himself". The New York Times. December 3, 2015. ↑ "Mark Zuckerberg and the Rise of Philanthrocapitalism". The New Yorker. December 2, 2015. ↑ "Mark Zuckerberg's Philanthropy Uses L.L.C. for More Control". The New York Times. December 2, 2015. ↑ "Why Mark Zuckerberg's huge new donation is going to an LLC rather than a charity". Vox. December 2, 2015. ↑ Katharine Mieszkowski (April 19, 2011). "President Obama's Facebook appearance aimed at young voters; Bay Area visit targets big donors". The Bay Citizen. Archived from the original on December 24, 2013. Retrieved December 23, 2013. ↑ David Cohen (February 14, 2013). "Protestors Target Mark Zuckerberg's Fundraiser For N.J. Gov. Chris Christie". AllFacebook. Retrieved December 23, 2013. ↑ Ben Branstetter (October 21, 2013). "Conservatives including Mark Zuckerberg, Grover Norquist urge House to pass immigration reform". United Press International. Retrieved December 23, 2013. ↑ "Why Mark Zuckerberg is a conservative (and why that matters)". The Daily Dot. October 30, 2013. Retrieved December 23, 2013. ↑ "2013: Year of the Liberal Billionaires". Politico. November 1, 2013. ↑ Julia Boorstin (February 13, 2013). "Mark Zuckerberg 'Likes' Governor Chris Christie". CNBC. Retrieved June 20, 2013. ↑ Kate Zernike (January 24, 2013). "Facebook Chief to Hold Fund-Raiser for Christie". The New York Times. Retrieved June 20, 2013. ↑ Young, Elise (June 8, 2013). "Zuckerberg Plans Fundraiser for Cory Booker's Senate Run". Bloomberg. Retrieved October 18, 2013. ↑ "Education". Silicon valley Community Foundation. ↑ Cassidy, Mike (February 15, 2013). "Cassidy: Silicon Valley needs to harness its innovative spirit to level the playing field for blacks and Hispanics". The Mercury News. Retrieved April 23, 2013. ↑ Constine, Josh (April 11, 2013). "Zuckerberg And A Team Of Tech All-Stars Launch Political Advocacy Group FWD.us". TechCrunch. Retrieved April 17, 2013. ↑ Ferenstein, Gregory (April 11, 2013). "Zuckerberg Launches A Tech Lobby, But What Will It Do Differently?". TechCrunch. Retrieved April 17, 2013. ↑ Malik, Om (April 11, 2013). "Why I have issues with Mark Zuckerberg's FWD.us". Gigaom. Retrieved April 17, 2013. ↑ Brian, Matt (April 11, 2013). "Mark Zuckerberg launches FWD.us with notable Silicon Valley execs in fight for immigration reform". The Verge. Retrieved April 17, 2013. 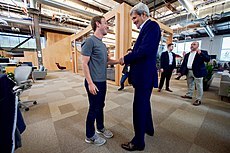 ↑ Zuckerberg, Mark (April 11, 2013). "Facebook's Mark Zuckerberg: Immigration and the knowledge economy". The Washington Post. Retrieved April 17, 2013. ↑ "About Us". FWD.us. Retrieved April 17, 2013. ↑ Handley, Meg (April 30, 2013). "Facebook's Zuckerberg Takes Heat Over Keystone, Drilling Ads". U.S. News & World Report. Archived from the original on May 3, 2013. Retrieved May 3, 2013. ↑ Weiner, Rachel. "Liberal groups boycotting Facebook over immigration push". The Washington Post. Retrieved August 7, 2013. ↑ Constine, Josh (June 20, 2013). "Zuckerberg Replies To His Facebook Commenters' Questions On Immigration". TechCrunch. Aol Tech. Retrieved June 20, 2013. ↑ Gallagher, Billy (June 30, 2013). "Mark Zuckerberg 'Likes' SF LGBT Pride As Tech Companies Publicly Celebrate Equal Rights". TechCrunch. AOL Inc. Retrieved July 2, 2013. ↑ Evelyn M. Rusli (June 30, 2013). "Mark Zuckerberg Leads 700 Facebook Employees in SF Gay Pride". The Wall Street Journal. Retrieved July 2, 2013. ↑ Emery, Debbie (December 9, 2015). "Mark Zuckerberg Vows to 'Fight to Protect' Muslim Rights on Facebook". TheWrap. Retrieved December 10, 2015. ↑ White, Daniel (December 9, 2015). "Mark Zuckerberg Offers Support to Muslims in Facebook Post". Time. Retrieved December 10, 2015. ↑ Griffin, Andrew (December 9, 2015). "Mark Zuckerberg speaks in support of Muslims after week of 'hate'". The Guardian. Retrieved December 10, 2015. ↑ Cenk Uygur (December 10, 2015). "Mark Zuckerberg Stands With Muslims". The Young Turks. Retrieved December 11, 2015. ↑ "Zuckerberg Invokes Jewish Heritage in Facebook Post Supporting Muslims". Haaretz. December 10, 2015. Retrieved December 10, 2015. ↑ Tait, Robert (December 9, 2015). "Mark Zuckerberg voices support for Muslims amid Donald Trump ban row". The Daily Telegraph. Retrieved December 10, 2015. 1 2 King, Shaun (February 25, 2016). "Mark Zuckerberg forced to address racism among Facebook staff after vandals target Black Lives Matter phrases". New York. Daily News. Retrieved February 26, 2016. ↑ Jessica, Guynn (February 25, 2016). "Zuckerberg reprimands Facebook staff defacing 'Black Lives Matter' slogan". USA Today. Retrieved February 26, 2016. ↑ Snyder, Benjamin (February 25, 2016). "Mark Zuckerberg Takes Facebook Workers to Task Over 'All Lives Matter' Graffiti". Fortune. Retrieved February 26, 2016. ↑ "White Coats on a Rainbow of Students", Spotlight, UCSF School of Medicine. Cf. Priscilla Chan, 23. ↑ Spiegel, Rob (December 20, 2010). "Zuckerberg Goes Searching in China". ↑ "Facebook founder Mark Zuckerberg learn chinese every morning". ChineseTime.cn. September 29, 2010. ↑ Stein, Joel. "Facebook's Mark Zuckerberg marries sweetheart". Archived from the original on May 24, 2012. Retrieved May 19, 2012. ↑ "Facebook's Mark Zuckerberg marries Priscilla Chan". CBS News. Retrieved May 20, 2012. ↑ Wohlsen, Marcus (May 19, 2012). "Facebook's Mark Zuckerberg marries longtime girlfriend, Priscilla Chan: Palo Alto, Calif., ceremony caps busy week after company goes public". MSNBC. Associated Press. Retrieved May 20, 2012. ↑ "Facebook founder Mark Zuckerberg to become a father". BBC News. July 31, 2015. Retrieved August 1, 2015. ↑ "The Switch Mark Zuckerberg and Priscilla Chan to give away 99 percent of their Facebook stock, worth $45 billion". ↑ "A letter to our daughter". facebook.com. Retrieved December 1, 2015. ↑ Kell, John (February 8, 2016). "Mark Zuckerberg Reveals Daughter's Chinese Name". Fortune. Retrieved February 29, 2016. In a pretty adorable video shared by the tech executive over the weekend, Zuckerberg and his wife Priscilla Chan said their daughter Max's Chinese name is Chen Mingyu. ↑ "Mark Zuckerberg and his wife just unveiled their new baby girl to the world". Fox News Channel. August 28, 2017. Retrieved August 28, 2017. ↑ "Mark Zuckerberg is back in China as Facebook eyes opportunity to finally enter the country". Business Insider. October 28, 2017. ↑ Vara, Vauhini (November 28, 2007). "Just How Much Do We Want to Share On Social Networks?". The Wall Street Journal. Retrieved December 30, 2016. ↑ Daniel Alef (October 17, 2010). Mark Zuckerberg: The Face Behind Facebook and Social Networking. Titans of Fortune Publishing. ISBN 9781608043118. Retrieved December 30, 2016. ↑ "Facebook Is Injecting Buddhism Into Its Core Business So It Can Be More Compassionate". Retrieved June 25, 2013. ↑ "Mark Zuckerberg says "Buddhism is an amazing religion". Retrieved October 27, 2015. ↑ Zauzmer, Julie (August 29, 2016). "Pope Francis and Facebook's Mark Zuckerberg had a meeting today - The Washington Post". The Washington Post. Retrieved January 7, 2017. ↑ Fox, Emily Jane (August 29, 2016). "Mark Zuckerberg Gives the Pope an Unusual Gift". Vanity Fair. Retrieved January 7, 2017. ↑ Esteves, Junno Arocho (August 29, 2016). "Pope meets with Facebook founder Mark Zuckerberg". America. Retrieved January 7, 2017. ↑ Bailey, Sarah Pulliam (May 25, 2017). "Mark Zuckerberg shares the prayer he says to his daughter every night -". The Washington Post. Retrieved June 6, 2017. Facebook founder Mark Zuckerberg gave the commencement address at Harvard University on Thursday, closing his speech by sharing a Jewish prayer called the "Mi Shebeirach," which he said he recites whenever he faces a big challenge and which he sings to his daughter, thinking of her future, when he tucks her in at night. ↑ Hallowell, Billy (May 26, 2017). "After Abandoning Atheism, Facebook Founder Mark Zuckerberg Reveals the Prayer He Sings to His Daughter Every Night Before Bed". Faithwire. Retrieved June 6, 2017. It was during Zuckerberg's commencement address at Harvard University that he shared a Jewish prayer called the "Mi Shebeirach"— an invocation that he said he recites as he copes with major challenges in life and also when he tucks his child in at night, the Washington Post reported. 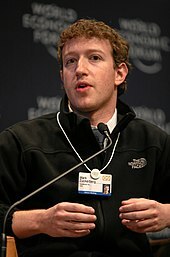 Wikimedia Commons has media related to Mark Zuckerberg.